Alabama’s 42nd governor, Gordon Persons, was born on this day in Montgomery. 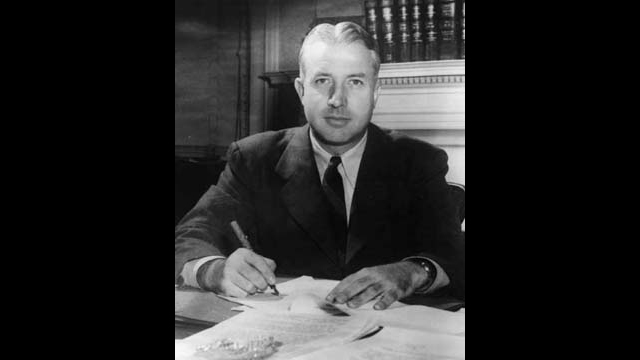 Although he served as governor from 1951 to 1955, Persons’ tenure is usually overshadowed in history by his larger-than-life predecessor and successor, James E. “Big Jim” Folsom Sr. In 1930, Persons and partner Howard Pill founded Montgomery’s first radio station, WSFA. In 1935, Gov. Bibb Graves appointed Persons chairman of the state Rural Electrification Authority. After three years on the job, the entrepreneurial Persons formed his own engineering firm and installed more than 10,000 miles of electrical lines in Alabama. By 1940, Persons had earned a small fortune and was a hero to many farmers who benefited from his efforts to bring electricity to families in rural Alabama. He was elected president of the Alabama Public Service Commission in 1944. After campaigning for governor around the state in a helicopter, Persons won the 1950 gubernatorial election that November with more than 90 percent of the vote. His first official act as governor was to call a meeting of the board of trustees at Auburn University to fire football coach Earl Brown and then to hire Selma native Ralph “Shug” Jordan.